47 p., 1 leaf of plates : ill. (some col.) ; 17 cm. WAG:BYMARY ELLEN MARTINEAU.WITH COLOURED FRONTISPIECE.LONDON:PREDERICK WARNE AND CO.,BEDFORD STREET, COVENT GARDEN.NEW YORK: SCRIBNER, WELFORD, AND CO.
14 Wag: a Tale for Children.and then Tom's mother would wonder whatmade him so wet, and Tom too, for Tom wasalmost as wet as Wag. "Never mind," thought Tom, "I can't help it,for I must go home to put on my Sunday clothesbefore I can take Wag through the town." Sohe ran off home with Wag under his arm.His mother was making the beds, and happilydid not see how wet boy and dog were, and askedTom no questions till she saw him putting onhis best clothes; then she said,"Why, Tom, d' ye think it's Sunday ? ""No, mother," said he, "but I 'm going outto-day; I'll not spoil them, you'll see. ""It's like to be long before you get anymore," said his mother, "so you'd better takecare of these. But what's my lad after to-day,I wonder? "Tom could not answer, and his mother didhot press him, for he was always a good lad toher, and she was sure she might trust him. 16 Wag: a Tale for Children.in the water, and then asked his mother if shewanted him to do anything else for her. Hewas right glad to hear her answer, "No, thankyou, Tom," and darted off at once with Wagunder his arm.He hugged his little pet, and kissed him overand over, as he ran down the court. He thoughtWag had never looked so pretty in his life, withall his long grey hair so soft and silky-looking,so beautifully clean, down to his little toes; andWag seemed particularly proud of himself, forhe set his ears up in the most knowing, con-ceited way at every dog he saw, and would havejumped out of Tom's arms many times if Tomhad not held him very tight. Tom told himover and over again what was going to happento him, and why, and tried to comfort him aboutit; for Wag's great brown eyes looked sadly atTom as he talked to him, and Tom almostthought he understood all about it, he looked sovery wise. The Children's Hospital. 21down street after street, too breathless to callout any more for help, and never lost sight ofhim till in an unlucky moment Tom's footslipped over something he .did not see in hishaste, and down he fell with his head againstsome railings.He hardly knew even this much about his fall,and knew no more of what happened to himtill he found himself in a clean comfortable bedin a large room with many other beds, andfound a strange woman sitting by him, and awet cloth tied round his head. Some time musthave passed, for it was now quite dark exceptfor the fire-light, which showed him the room,and the nurse sitting by his bed." Who brought me here ?" asked Tom, " andwhose house is this ?"" It's the Children's Hospital," said the nurse,"and I don't know who brought you here-thepolice, I dare say."" How long have I been here ?" 22 Wag: &amp; Tale for Children. "Oh, bless you! not long; you've come tovery quick: only an hour or two since you wereput to bed."" Where are my clothes?" cried Tom, startingup; "I must get up and go home to motherdirectly."" Now, don't you fuss about mother, but liedown again like a good lad, and go to sleep:you 'll not walk yet a bit. "And indeed Tom had to obey, for besides avery bad headache that came on when he startedup, he felt one foot give way when he tried fora moment to stand, and it gave him violent pain. "What's the matter with me?" asked he;"I forget how I got hurt."" Oh, don't fret about it, lad : you '11 get wellnicely here, and have all you want. ""But I wish some one could go and tellfather and mother I'm here,-they'11 think I'mlost, killed, or something, I know they will,"said Tom. 26 Wag: a Tale for Children.for some time after that. On certain days, whenvisitors were allowed, his father or his mothereame to see him. Tom reckoned eagerly on theircoming, and was always quite proud to showthem how much better he was than the last time.Then they told him how they were all going onat home; and though his father seemed hardlywilling to tell him, it gladdened Tom's heart tohear that a district visitor from the relief com.mittee had found them out at last, and giventhem some help in money and clothes. Tomclapped his hands for joy, and thought with lessbitterness of his lost fifteen shillings. "Aren't you glad, father ?" asked he, seeingthat his father hardly seemed to share in his burstof joy. "Why, yes, lad, I hope I'm not ungrateful.I thank 'em from my heart, God knows, forthey've maybe saved your poor mother's life,and baby's; and if a man won't be thankful forthat, he won't for nothing in this world." Tom's Prayer. 47now, when he said his prayer that night, he didearnestly thank God for giving him such a goodhappy home, such a dear good father and motherand sisters and little brother, and such a dear,faithful little dog as Wag. 16 Wag: a Tale for Children. in the water, and then asked his mother if she wanted him to do anything else for her. He was right glad to hear her answer, "No, thank you, Tom," and darted off at once with Wag under his arm. He hugged his little pet, and kissed him over and over, as he ran down the court. He thought Wag had never looked so pretty in his life, with all his long grey hair so soft and silky-looking, so beautifully clean, down to his little toes; and Wag seemed particularly proud of himself, for he set his ears up in the most knowing, conceited way at every dog he saw, and would have jumped out of Tom's arms many times if Tom had not held him very tight. Tom told him over and over again what was going to happen to him, and why, and tried to comfort him about it; for Wag's great brown eyes looked sadly at Tom as he talked to him, and Tom almost thought he understood all about it, he looked so very wise. 14 Wag: a Tale for Children. and then Tom's mother would wonder what made him so wet, and Tom too, for Tom was almost as wet as Wag. "Never mind," thought Tom, "I can't help it, for I must go home to put on my Sunday clothes before I can take Wag through the town." So he ran off home with Wag under his arm. His mother was making the beds, and happily did not see how wet boy and dog were, and asked Tom no questions till she saw him putting on his best clothes; then she said, "Why, Tom, d' ye think it's Sunday ?" "No, mother," said he, "but I 'm going out to-day; I'll not spoil them, you'll see." "It's like to be long before you get any more," said his mother, "so you'd better take care of these. But what's my lad after to-day, I wonder?" Tom could not answer, and his mother did hot press him, for he was always a good lad to her, and she was sure she might trust him. The Children's Hospital. 21 down street after street, too breathless to call out any more for help, and never lost sight of him till in an unlucky moment Tom's foot slipped over something he .did not see in his haste, and down he fell with his head against some railings. He hardly knew even this much about his fall, and knew no more of what happened to him till he found himself in a clean comfortable bed in a large room with many other beds, and found a strange woman sitting by him, and a wet cloth tied round his head. Some time must have passed, for it was now quite dark except for the fire-light, which showed him the room, and the nurse sitting by his bed. Who brought me here ?" asked Tom, and whose house is this ?" It's the Children's Hospital," said the nurse, "and I don't know who brought you here-the police, I dare say." How long have I been here ?" Tom's Prayer. 47 now, when he said his prayer that night, he did earnestly thank God for giving him such a good happy home, such a dear good father and mother and sisters and little brother, and such a dear, faithful little dog as Wag. WAG: BY MARY ELLEN MARTINEAU. WITH COLOURED FRONTISPIECE. LONDON: PREDERICK WARNE AND CO., BEDFORD STREET, COVENT GARDEN. NEW YORK: SCRIBNER, WELFORD, AND CO.
26 Wag: a Tale for Children. for some time after that. On certain days, when visitors were allowed, his father or his mother eame to see him. Tom reckoned eagerly on their coming, and was always quite proud to show them how much better he was than the last time. Then they told him how they were all going on at home; and though his father seemed hardly willing to tell him, it gladdened Tom's heart to hear that a district visitor from the relief com. mittee had found them out at last, and given them some help in money and clothes. Tom clapped his hands for joy, and thought with less bitterness of his lost fifteen shillings. "Aren't you glad, father ?" asked he, seeing that his father hardly seemed to share in his burst of joy. "Why, yes, lad, I hope I'm not ungrateful. I thank 'em from my heart, God knows, for they've maybe saved your poor mother's life, and baby's; and if a man won't be thankful for that, he won't for nothing in this world." 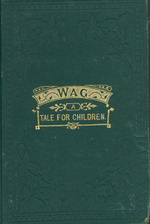 22 Wag: & Tale for Children. "Oh, bless you! not long; you've come to very quick: only an hour or two since you were put to bed." Where are my clothes?" cried Tom, starting up; "I must get up and go home to mother directly." Now, don't you fuss about mother, but lie down again like a good lad, and go to sleep: you 'll not walk yet a bit." And indeed Tom had to obey, for besides a very bad headache that came on when he started up, he felt one foot give way when he tried for a moment to stand, and it gave him violent pain. "What's the matter with me?" asked he; "I forget how I got hurt." Oh, don't fret about it, lad : you '11 get well nicely here, and have all you want." "But I wish some one could go and tell father and mother I'm here,-they'11 think I'm lost, killed, or something, I know they will," said Tom.